You will all have played the game of remembering where your favourite place to play was, well here is mine. Three water troughs in line adjacent to a wild cress bed from whence a tiny stream ran down to the 10 acre (remember those?) field, big by Dales standards and out of bounds to me. I was five. I was fascinated when I returned recently with my cousin’s daughter, how she just headed in the same direction and did the same things; somehow reassuring! Even more so when her uncle arrived and jumped up on top of their slippery edges! I used to go down the lane next to our house in Appletreewick (well what a name?) 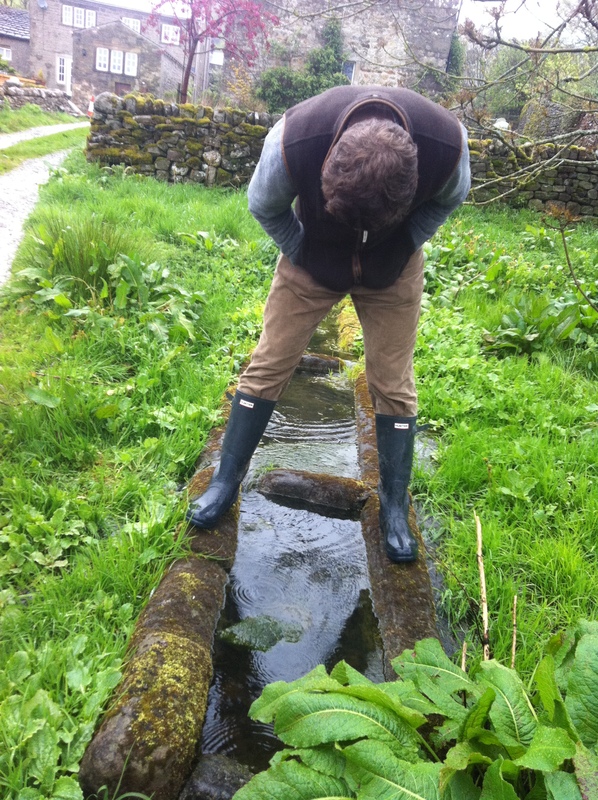 and head for the troughs and stream pouring out of the wild cress bed. We spent hours damn building, kicking the water and filling a jam jar. Little water creatures, snails, shrimps, larva, boatman all were there. We only had the cottage from when I was four to eight years old, cold and damp, logs that wouldn’t light, high windows that I couldn’t see out of. My Cousins used to visit us and about fourteen of us used to play Kick Can. 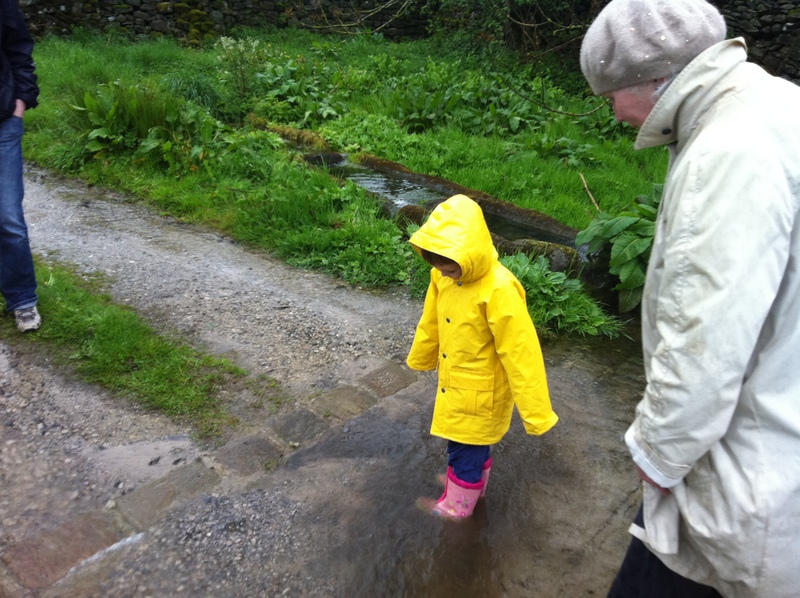 We had freedom, we could play anywhere in the village and down by the river Wharfe. My Aunt knitted me a jumper of brightly coloured patches so that I could be seen from far away. The Wharfe was dangerous, it ran deep and strong in places, but in others it was benign with places to swim and slide. Despite this idyll of nature in childhood I would not want this blog to be seen as an endorsement of NDD (Nature Deficit Disorder), wonderful though the natural environment is, I still feel irritated by the NDD syndrome of having to label children by their disabilities. There are many advantages of living in cities and more important issues that we need to tackle, the most important of which is probably the lack of freedom that we now give to our children. I believe that we as a sector need to be overcoming fear, fear of traffic, fear of strangers. We ought to be concentrating on supporting parents and politicians and tackling the media on these issues, rather than dissipating our energies on a range of lesser ones, which are in danger of distracting, like Jubilee and Olympics from the real more fundamental issues we must address! No doubt a little influenced by Grumpysutcliffe….. we allow our 6 & 8 year olds to go over the wall to neighbors and play on the track up behind our house. A few weeks back a neighbor came to the door to say did we know our youngest was in the pub & whats more someone had bought him a drink! A little alarming, but funny and good to know that in the old fashioned way our neighbors are looking out for them on our behalf too. I agree that “Nature Deficit Disorder” is not the best rallying cry for children’s play freedom, and probably not good science either. For good or ill, however, the meme seems to be out of the bottle – our local paper in York the other day had quite a long piece about the need for outdoor play which used the expression freely, albeit with no acknowledgment to Richard Louv. If the phrase is helping to win us allies, I don’t think we should be too picky. I certainly don’t think it’s a case of either-or when it comes to children’s access to nature vs. children’s freedom to play out. Of course all children need freedom to play out where they live, even if that is a concrete jungle, but the quality of their play environment is also critical. There is ample evidence that all children – just like five year old Grumpysutcliffe – benefit from access to play in semi-wild nature. Sadly, many children won’t get that unless adults organise it for them, whether they live in the inner city, manicured suburbia or agribusiness countryside. Hi Mark, yes, how could I possibly disagree. Playing with and experiencing nature is an excellent experience for children, I could hardly deny that, after this blog could I! No, it is part of all the rich opportunities that we would like children to have. What I object to is the disorder bit, partly because I think it is replacing issues in play that are far more important and shouldn’t be displaced!